Now that the second quarter is in the books, we thought we would take a look back at how we arrived at a 1.8% increase in the S&P 500 so far this year. It was indeed a Tale of Two Quarters. For the first quarter of the year, we saw heavy selling nearly across the board, with the S&P 500 falling 11.7%. 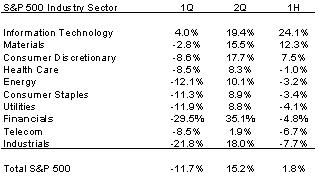 Information Technology was the only sector to post an increase during the quarter, while financials continued to get hammered (down 29.5%). Investors had yet to see the “green shoots” of spring that we’ve been hearing so much about lately. The second quarter, on the other hand, was a completely different story. The strong and broad-based rally that yielded a 15.2% increase in the S&P 500 for the quarter actually started on March 10 following the S&P 500 low on March 9. From the S&P 500 peak on October 9, 2007 to the low on March 9, 2009, the S&P 500 had dropped a stunning 57%. Since that March 9 low, however, the S&P 500 is up over 36%. We now stand about 41% off the high of October 9, 2007. Below we show how the S&P 500 performed by industry sector so far this year. What can glean from the market action so far this year? One thing is crystal clear to me. The Financials are driving the overall market. The S&P 500 Financial sector was down 29.5% in the first quarter before rebounding 35.1% in the second quarter. The low in the Financials corresponded very closely to the low in the overall market. 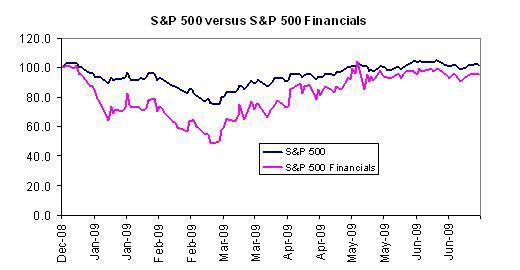 Financials bottomed out on March 6, 2007 (compared to March 9 for the S&P 500), after falling 84% from the high in early 2007. Since the March 9 low for the Financials, the sector has rallied nearly 100%, accounting for a sizable portion of the 36% rebound in the S&P 500 since that time. I suppose my message is that if you’re cautious on the Financials (like we are), it would stand to reason that the market will need to find new leadership if this rally is to continue. We believe further markets gains will be achieved only though leadership from high-quality, financially strong companies with the ability to take market share in an environment that will continue to be very difficult. In other words, the low-hanging fruit has already been harvested. Investors are not likely to continue embracing the riskiest of securities until and unless corporate profits show a meaningful rebound. We think we’re still a ways off. 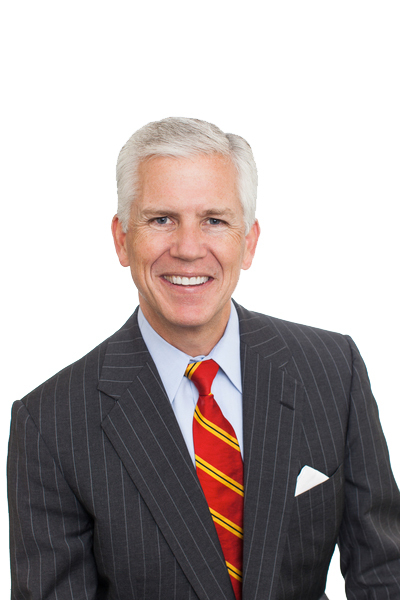 How have Farr, Miller & Washington clients fared so far this year? Our composite of fully-discretionary accounts continues to solidly outperform the S&P 500 for the year-to-date period. We have achieved this outperformance while maintaining our defensive posture. We continue to favor companies with rock solid balance sheets and strong management teams as we navigate through this downturn.